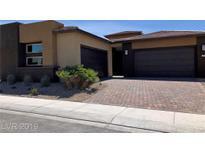 Below you can view all the homes for sale in the Canyons subdivision located in Las Vegas Nevada. Listings in Canyons are updated daily from data we receive from the Las Vegas multiple listing service. To learn more about any of these homes or to receive custom notifications when a new property is listed for sale in Canyons, give us a call at 702-323-5939. 4-car garage and an extension in the rear of the house for even more space. Quartz counter-tops throughout. MLS#2086016. New Home Resource. Partial strip views from the loft. No home behind you! MLS#2083426. LUXE Estates & Lifestyles LLC. Beautiful open floorplan, granite counters, upstairs loft, one bedroom downstairs with full bath, formal dining and living room, huge master bedroom upstairs, close to schools and shopping.You will love it. Propety sold as-is. MLS#2081974. Paradigm Realty. *kitchen Features Granite Counters, Stainless Steel Appliances & Pull-out Cabinets*dramatic Ceilings*abundant Natural Light*anderson Doors*plantation Shutters Throughout*bedroom & Bath Downstairs*rv Parking*located At End Of Cul-de-sac! 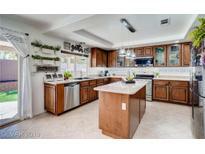 * MLS#2081765. Black & Cherry Real Estate. Master retreat w/lg tub w/massaging jets, double sink & walk-in closet! MLS#2077628. Keller Williams Southern Nevada. Covered Patio For Entertaining, Shed & Desert Landscaping, MLS#2072851. Realty ONE Group, Inc.
includes oven, washer/dryer, refrigerator and microwave. MLS#2063733. Compass Realty & Management, L.
Beautiful 5 bed/3ba home with pool in Silverado Ranch area*formal living & dining rms* open kitchen w/breakfast nook, granite counters, island*family rm w/two way fireplace to kitchen*bed & bath down*lg loft upstairs*lg, master with walk in closet, double sinks, garden tub, sep shower*pool *3 car garage* MLS#2041690. RE/MAX Advantage. Your Buyer WILL fall in LOVE! MLS#1528367. General Realty Group Inc.